Do you do the same thing every Sunday morning? For some people it might be a time for spiritual practice, for others a time to sit down with the newspaper, go play basketball or do something with their child. Whether we do them alone or with others, many of us have daily and weekly rituals that give shape to our days and give us something to look forward to. When we experience change in our life or we get very busy it becomes harder to maintain these rituals. It’s amazing how quickly reading the newspaper becomes a fond recollection when you have a new baby in your household. If you’re juggling the care of a sick parent with your own job and family responsibilities reclaiming this discretionary time may seem to make sense on the face of it, but it often has the effect of making us feel even more out of balance. Maintaining routines that are important to us, like eating dinner as a family or exercising keeps us grounded. There are only so many hours in the day and we may need to adjust our expectations by choosing simpler or prepared foods or by eating later, or taking a brisk walk instead of going to the gym. We may need to ask for support to be able to maintain routines during unusually busy times. Older children can take on more responsibility for dinner preparation and cleanup and even fairly young children can help by setting the table or washing the vegetables. This is more beneficial than everyone grabbing something on the fly or eating in front of the television which doesn’t provide an opportunity to reconnect and share experiences from the day. Special holidays are powerful family rituals that can bring us extraordinary feelings of warmth and closeness; however, the additional tasks required to prepare for holidays can also cause a lot of stress. Prioritizing tasks, streamlining routines and sharing the responsibilities can help prevent holiday preparation from feeling too burdensome. Remember that the joy in holiday rituals comes from spending time together and sharing a special meal. That doesn’t mean that it has to be the same meal every year or that it can only be prepared by one person. Informal family traditions are a wonderful way to foster family closeness without the added pressures that more formal occasions inevitably include. In our family, everyone gets breakfast in bed on their birthday. We started doing this when our children were very little as a way to make sure their special day started on a good note. Naturally, our kids wanted to reciprocate on our birthdays so the non-birthday parent was always on deck to prevent fires and other risks associated with young children cooking! It evolved into a ritual that we all look forward to. These days, seeing our “sleep till noon” teenager voluntarily get up early to be part of the breakfast in bed presentation is nothing short of miraculous! For young children there is great comfort in repetition and predictability. If you think back to your own childhood, chances are that these repetitive experiences (going to the bagel store on Sunday morning or going to the bakery after church) stand out prominently in your memory. Traditions evolve and change over time so if you feel like you aren’t connecting with family members regularly think about creating a new family ritual that fits with your lifestyle. It could be as simple as everyone sharing their “best and worst of the day” at the dinner table or getting everyone together for a shared activity on a weekly or monthly basis. Rituals provide structure and comfort in our busy lives. Prioritizing around individual routines that keep us “sane” can help us maintain feelings of well being even in extremely busy or stressful times. This usually means having to let go of something else or lowering our standards a bit but this is a good tradeoff for feeling happier. 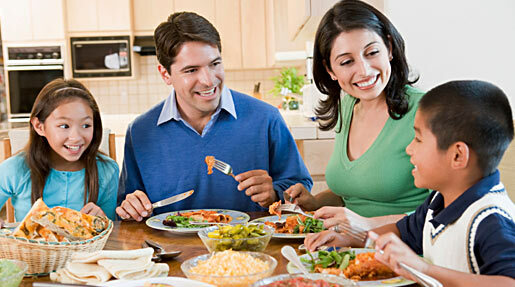 Family routines and rituals cement family bonds and strengthen family identity. As we head into the busy holiday season think about what is most important to you and your family in terms of enjoying your holiday time together. Put your time into those things and see if you can let go of other, less important aspects – be it sending out cards, or cooking everything from scratch. From our family to yours, wishing you a joyous, healthy and balanced Holiday Season. Summer is a distant memory at this point but some of you may have seen the summer film, “Julie and Julia,” which depicts the lives of Julia Child and Julie Powell (modern day blogger who spent a year cooking and blogging about every recipe in Julia Child’s book, “The Art of French Cooking”). I saw the movie with my Mom and my daughter and we all loved it. The movie inspired me to write about butter, something that makes almost everything taste better and which gets a bum rap these days thanks to a lot of confusion and misinformation on saturated fats. 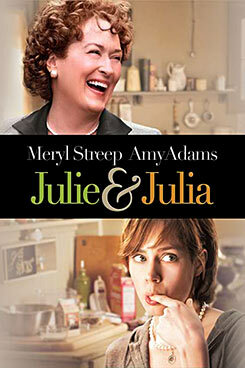 JULIE’S FAVORITE POT: In the movie, Julia Child (aka Meryl Streep) uses my favorite pot! I know it’s just a movie and maybe the real Julia never used my favorite pot but I’d like to think she did. This pot was an estate sale find, made in Holland of enamel coated cast iron. It was well used when I bought it, having belonged to a lady who died in her 90’s… just like Julia. Whenever I cook in it, I think of all the wonderful meals she must have prepared for the people she loved and it makes me smile — something a brand new Le Creuset just can’t offer! The fats in butter provide the building blocks of our cell membranes as well as many of our hormones, including vitamin D. When you eat butter with a meal it slows down the absorption of the food which keeps blood sugar steadier and keeps you feeling full longer. 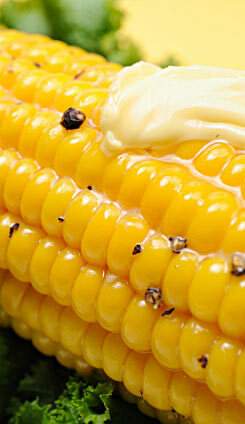 You may have read that you will absorb more nutrients from your food if you put some butter on it. This is because the fat in butter acts a carrier for the fat soluble vitamins A, D, E and K. It is also needed to convert carotene, a vitamin A precursor into vitamin A. Butter is an excellent fat for baking and sautéing because it is stable at high temperatures. You can also experiment with Ghee — which is clarified butter (butter that has had the milk solids removed). Ghee is sold in health and natural food markets and stores that sell Indian and South Asian foods… or, like Julia, you can make your own clarified butter! All butter is not created equal — there is a qualitative difference in butters depending on the source. It’s best to buy organic butter because non-organic butter may have been made from the milk of cows treated with growth hormones or antibiotics. Organic, grass-fed butter is better yet. Grass fed butter is becoming increasingly available as consumers become more educated about the health benefits of grass fed animal products. Butter from the milk of cows that have fed on grass is a deeper yellow color and contains more of the omega 3 essential fatty acids, vitamins A & E and beta-carotene. In other words, grass fed butter has healthier fats and more vitamins than butter from grain fed cows. You can buy grass fed butter in health and natural markets and online. Some brands refer to it as “pasture butter” which means the same thing. The deep yellow color is the distinguishing characteristic and local grass fed butter is available seasonally in spring, summer and fall since there aren’t any cows grazing on green grass in the winter time. How much butter should we eat? There is no one answer that is right for everyone. Diet is not one size fits all. There are some people who do very well on a low-saturated-fat diet while many other people need more fats in their diets to thrive. Differences can often be seen among people with different blood types and different metabolic types as well as different health conditions. Additionally, it is natural to eat more fat in the colder months – fat keeps us warm and, if we live in a colder climate, our bodies will be under less stress on a higher fat diet during the winter months. The amount of fat we eat does not have to be static throughout the year but rather can vary with the season. We Americans struggle with this issue of how much – we want to fit everything into a category of “good” or “bad” and if it’s “good” we want to supersize it! Marion Nestle puts it best in her book, What to Eat, when she says, “The range of healthful nutrient intake is broad, and the foods from the earth, tree or animal can be combined in a seemingly infinite number of ways to create diets that meet health goals. If you avoid butter because you think of it as an unhealthy fat you may want to reconsider. You can read more about it and better yet, you can try it and see how it feels in your body, which is always the best test. For more information on fats and oils see the March 2007 edition of the Mad Nutrition newsletter. General Note: These recipes are all in my “back to basics” collection meaning that they are all seasonal comfort foods that I have been cooking for years. Eating the same foods during certain seasons and on certain holidays is big part of our family tradition. We host Thanksgiving for our extended family every year and our spread wouldn’t be the same without the homemade applesauce. I delegated this task to my kids as soon as my oldest was able to “supervise” the others in peeling and cutting duties. Though none of them relish the job they do love eating it and don’t seem to mind the many compliments they receive on it either. They make two crock pots worth of this special sauce every year and the leftovers are gone before nightfall on Friday! *Use several different kinds of apples — we always use about a third granny smith (3-4 apples), a third macoun (when available) or other seasonal apples and others (braeburn, fuji, gala, mackintosh etc.). 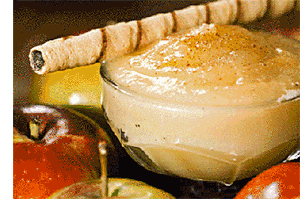 The applesauce is delicious when you use a variety of apples. Put apples in crock pot and squeeze lemon juice over them. Pour water over apples and mix. Combine sugar and cinnamon and mix into apples. Grate some nutmeg over top if desired. Cover and cook on high until apples are really soft and can be mashed with potato masher usually 2 1/2 – 3 hours, depending on apples (softer apples cook faster). Mash with potato masher and turn off crock pot. Let cool completely before refrigerating. 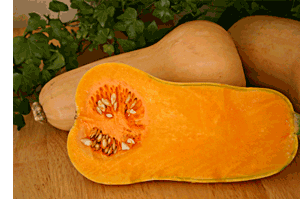 Of all the winter squashes we love butternut the most. For Thanksgiving we make it pureed and it is almost like having dessert with dinner! Roast two to three butternut squash — depending on the size of your crowd. To roast squash, cut squash in half and scoop out seeds. Seeds can be roasted and eaten separately if desired. Brush inside of squash with olive oil or melted butter and place it, facedown (skin side up) on jelly roll pan or cookie sheet. Roast squash in preheated, 400 degree oven for 45 minutes to an hour until squash is fork tender. When the squash is cool enough to handle, scoop out the orange flesh into a food processor. Add 1 – 2 tablespoons butter, generous sprinkling of cinnamon, 1 – 2 tablespoons of real maple syrup (to taste), a small pinch of sea salt and 1/2 teaspoon real vanilla. Pulse until squash becomes a smooth puree. Squash can be made the day before and refrigerated. Reheat in warm oven (350) until hot. This last recipe went around my neighborhood like wild fire about ten years ago. 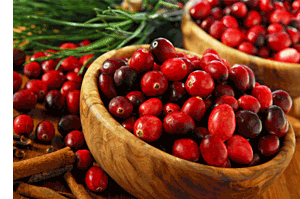 I love cranberries and because the season is so short I try to eat a lot of them when they are in season. This cranberry salsa has become a staple Thanksgiving hors d’oeuvres for us but it also makes a great bring along for any fall and winter gathering. If using food processor, chop onions first and lightly pulse cranberry mixture – over processing will result in a watery consistency. If increasing proportions in recipe (triple for a large crowd) do not triple sugar and jalapenos. Start with one pepper and 1/4 cup of sugar and gradually add more to taste so salsa is not overly sweet or spicy.